We all know that cats like to chase mice. How about chasing a spider that is being held by a mouse? 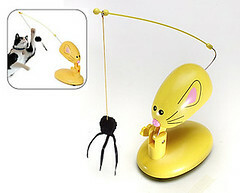 The Panic Mouse is an interactive toy that waves a wand through the air creating random and unpredictable mouse-like movements (so your cat will either love it or absolutely hate it and just want to kill it). At the end of the plastic wand is a spider toy and numerous cats can play with the Panic Mouse at once. The Panic Mouse was awarded top ten cats toys by Cat Watch magazine and best toy overall by Tufts University School of Medicine. This entry was posted on Tuesday, May 22nd, 2007 at 3:52 am	and is filed under Cats, National Dog, Cat & Pet Info, Products & Services for Cats & Dogs. You can follow any responses to this entry through the RSS 2.0 feed. Both comments and pings are currently closed. Always use toys like this only when the cats are supervised. The string can get twisted around a cat. Cute, but I would NEVER buy it! Why? Because it’s MADE IN CHINA. It probably cost them $1.00 to make and they’re charging $29.00! Most likely it will fall apart in a matter of days. After the pet recall, I swear I will NEVER buy anything from China sold here in the US ever again.